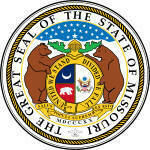 The red, white and blue State Flag of Missouri features a central image of the seal of state surrounded by a circle of symbolic white stars on a blue background. The symbolism of the ensign is described below. The flag serves as a symbol of honor, heritage and regional pride and is displayed at state buildings. There is a strict Order of Precedence for flags. State Flags are displayed in order as they entered the Union. Car Flags are often displayed to represent of an individual's allegiance to their state. Missouri State car flags are used by their owners as mobile emblems of their home. Car flags are usually made from strong materials and are attached to a car via a pole and clip window attachment. What is the design of the Missouri state flag? What do the stars symbolize in heraldry? What do the bears symbolize? The grizzly bears support the seal and symbolize the state's strength and the courage of its citizens. The front facing helmet above the seal represents state sovereignty. The helmet with an image representing an olive branch on either side, symbolizes peace. What is the shape and Missouri flag ratio? The 'Hoist' is the width and the 'Fly' is the length. The ratio is 10:17 meaning it is 10 units tall for every 17 units wide. Who designed the Missouri State Flag? 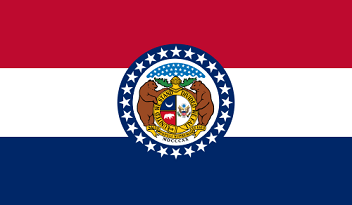 What is the history of the Missouri State Flag? 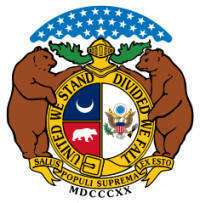 1861: During the Civil War (1861-1865) the Missouri state militia carried a flag bearing the Missouri coat of arms featuring the grizzly bear, the bald eagle, olive branches, arrows and a crescent moon with the words "United We Stand, Divided We Fall"
1913: This design became the central feature of a design by Marie Elizabeth Watkins Oliver that was adopted as the official Missouri State Flag in 1913. The Missouri flag is kept and used as required by the code specified in the constitution of the state.